What is painting with light ? Photography is a greek word and also means painting with lightphoto = from the Greek phos meaning light. combining a short flash burst of light with the addition of light drawing so both of the lights are visable. This is the picture that did not go so well as the drawing of light went completily wrong what we intended to draw came out very wrong. What would be even better if ..
-If discised to draw or write something less complicated it would of came out a lot better. -Also mess about and change the settings a bit as some of the light is over exposed. - Next time maybe have to different colours so you can see the two separate drawing more clearly. Painting with light in photography is a very creative technique , using to main objects one which is a high tech camera i.e cannon other is a neon light. Some people think doing this technique is tricky but honestly it is not. With light painting, you tack your photographs in darkness, leaving the shutter open for long periods, and then manipulate points or beams of light in front of the lens. 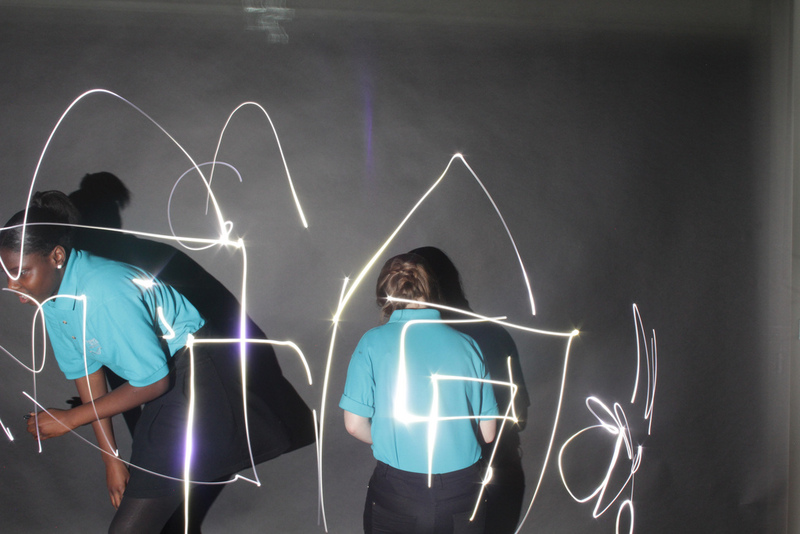 Each light painting can take minutes or even hours, depending on the effect you want. Such a long exposure allows you to use flashlights and other sources of light to paint in midair and pick out objects that you want to appear in the photography. This technique will open up a whole new avenue of artistry in your photography, and the effect is surreal. People have actually used the same way for many years to take photo, Rayograms ect.. but its just over the years cameras have been developed allowing you to change settings. Here are some of the pictures that me and my group done. - The black back round worked very well as it makes the light show up a lot more.